At Footprints day Nursery our Bumble Bee room caters for babies from 3 months to 2 years old. It is a large room bright and stimulating which has a loving, friendly and inviting environment. 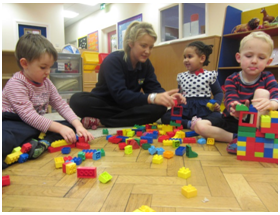 At Footprints Day Nursery our Caterpillar and Butterfly room staff provides a structured environment to help children develop their social skills and interact with other children. Staff organise activities around the seven areas of learning.